Macaroni and cheese is a little like chocolate — often it’s ordinary, sometimes it’s sublime, but either way it’s tasty. I will admit that I have been guilty of coming home, tired and hungry, after a long day at work and opening a box of shells and powdered cheese. With enough black pepper, I find this a totally comforting, one bowl dinner. But it always makes me feel sad, because with just a little more energy and not much more time, I could have eaten something wonderful. Anne, of course, is a big fan of macaroni and cheese (the woman subsists, essentially, on complex carbohydrates and cheese). So having a recipe for homemade mac n’ cheese that I can put together on a week night with stuff we almost always have on hand is essential to my marriage. I like to bake this version in a low gratin dish because you get a larger surface area for covering with breadcrumbs that get all toasty and crusty when fused with cheese in the oven. The interior, though, is creamy with a significant bite from the cheese. If you enlist a partner to grate the cheese while you boil the pasta and whisk the sauce, you can have the whole thing assembled and in the oven in 25 minutes. Once the sauce is thickened, add salt and pepper to taste (about 1 teaspoon kosher salt and ½ teaspoon black pepper) and remaining spices, whisking until thoroughly combined. Remove the sauce from the heat and add the 2/3 of the grated cheese by handfuls, whisking to incorporate after each addition. Taste the sauce at this point to see if it needs more salt or pepper. Pour sauce over the cooked pasta and stir to combine. 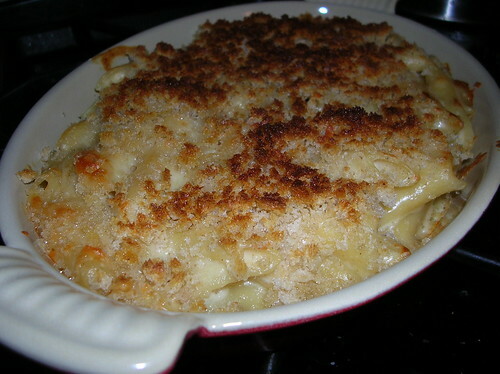 Pour half the pasta and cheese sauce mixture into the prepared gratin dish. Sprinkle on half the remaining grated cheese. Add the rest of the pasta mixture and sprinkle with remaining cheese. 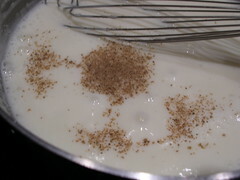 In a small bowl, melt remaining tablespoon of butter and mix with bread crumbs. 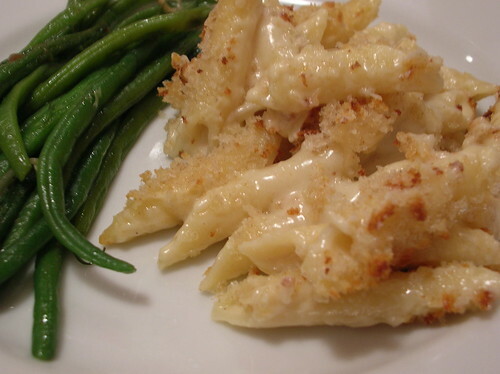 Sprinkle buttered bread crumbs on top of macaroni and cheese and bake about 30 minutes until hot and bubbling. If your bread crumbs aren’t brown enough for your liking, put the dish under the broiler for 2 – 3 minutes. Serves 4 for dinner, 6 — 8 as a side dish. * If you want to speed up the sauce, you can warm the milk in the microwave (or on the stove) before adding it to the roux. This entry was posted in cheese, dinner, pasta, pint-sized diners, side dish, Uncategorized. Bookmark the permalink. Oh hooray! Thank you for this post, just in time for my birthday. I’ll make sure to forward this to Jared. Delicious! Thank you, thank you, thank you! This will most definitely be the first meal I make once I get settled in my new apt. !